The VetCorps Leadership Crew (VCLC) is the first of its kind. NFO will train VCLC crewmembers to transition into a VetCorps Crew Leader in the Spring of 2019. As part of a crew and in preparation for a leadership role, this position will be demanding both physically and mentally. 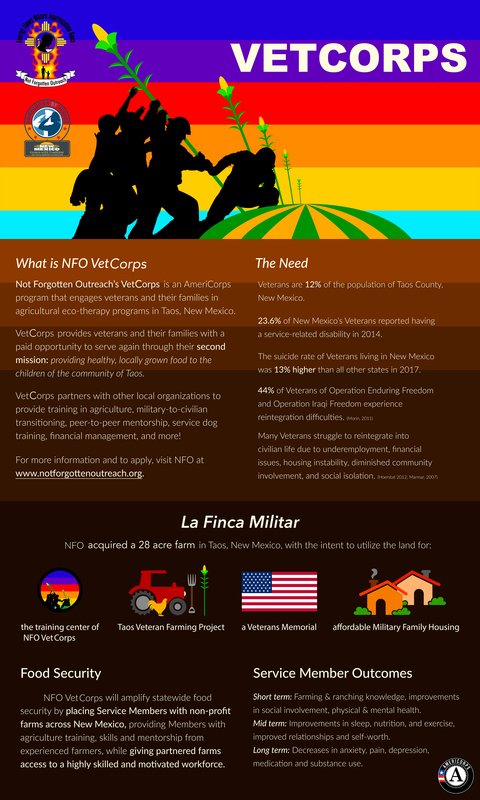 The VCLC will participate in agricultural projects at Not Forgotten Outreach and engage in therapeutic activities to strengthen the ability of veterans to transition successfully into civilian life. We offer veterans and their families a paid opportunity to engage in a second mission: feed local children and the community. The VCLC is an AmeriCorps position requiring a minimum of 450 hours of service. Upon completion of service, members receive a Segal AmeriCorps Education Award of $1612.43. VetCorps offers veterans and their families a paid opportunity to engage in a second mission: feeding local children and the community. VetCorps Crew Supervisors will lead crews in agricultural projects such as hydroponics, traditional row crops, and animal husbandry at Not Forgotten Outreach while also engaging in therapeutic activities to strengthen the ability of veterans to transition successfully into civilian life. VetCorps Crew Supervisors will have a daily role in supervision, program design and implementation, while ensuring deadlines are met. As both a crew member and part of the leadership team, Crew Supervisors will face many unique and sometimes demanding challenges. All VetCorps Crew members will receive both personal and professional development training in topics such as First Aid/CPR, hydroponics, and other agricultural trainings.